Tension wire is also sometimes used in place of top rail in security applications because it makes the fence more difficult to climb. When using tension wire in place of top rail, a brace and truss setup is typically installed to keep the terminal posts from pulling over. Smooth tension wire / utility wire has a wide number of uses, including residential fencing. It is typically available in 9, 11, 12, and 12.5 gauges. 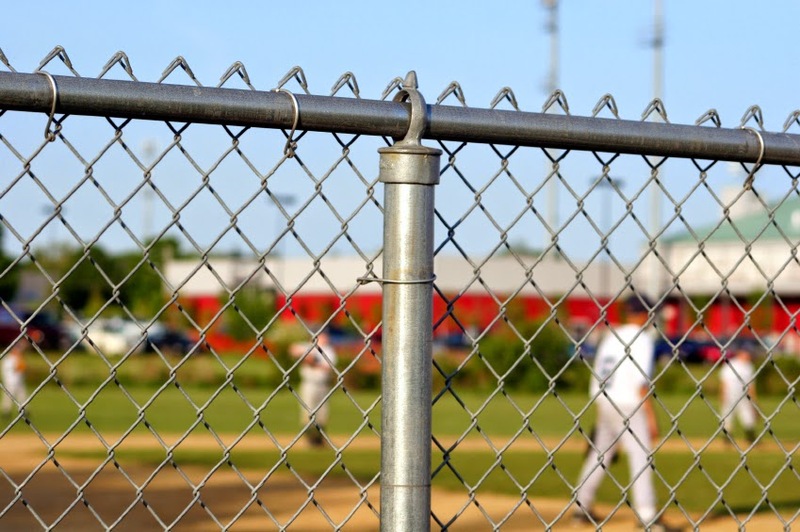 The most common use is in place of bottom rail on chain link fences. Marcelled tension wire, which is usually 7 gauge, is used in commercial and industrial fencing applications. Due to the heavy gauge, Marcelled tension wire has crimps, or kinks, in it to facilitate stretching; without the crimps, stretching the 7 gauge wire over the length of the fence would be very difficult. Barb arms, like loop caps fit over the top of your line posts and have a hole in them to allow the top rail to pass through. Barb arms are available in 2 types, 3-wire and 6-wire. 3-Wire arms have 3 “Z” cuts or notches in them to hold 3 strands of barbwire. 6-wire arms have a V shape with 3 “Z” cuts on each side. Line Rail Clamps are used to secure mid-brace rails and bottom rails to your line posts. They are sold in 2 pieces, and are assembled around the post and attached using a carriage bolt & nut. Tension bands are used in combination with tension bars to secure the stretched chain link fabric to a terminal post. The bands are placed around the terminal post, and hold the tension bar in place with a carriage bolt. There are two types of tension bands, flat and beveled. Flat bands are lighter, have flat edges, and are typically used for residential fencing applications. Beveled bands, on the other hand, are typically heavier with a thicker zinc coating, have a beveled edge, and are used in commercial projects. Tension bars are flat steel extrusions, usually 5/8” or ¾” thick, which are used to hold the stretched wire fabric in place at the terminal post. The tension bar is held in place by tension bands spaced every 12” apart on the terminal post. Brace bands are used to connect other fittings like rail ends, tension wire, and barbwire to your terminal posts. Like tension bands, brace bands come in flat and beveled varieties. Rail ends secure top, mid, and bottom rails to your terminal posts. They are held on to the terminal post with a brace band and 1 ¼” x 5/16” carriage bolt. Rail ends are typically available in aluminum (residential grade) and pressed steel (commercial grade). Commercial grade rail ends are often combo rail ends, which have a hole in them to insert a bent truss rod in a brace and truss setup. Post caps fit over the top of your chain link posts to keep water and insects out. They fit over the outside of your post, so a 2" cap will fit on the outside of a 2" (1 7/8" O.D.) post. In most situations, you will only use post caps on your terminal posts because loop caps will be used on your line posts to hold your top rail. Post caps are generally available in aluminum and pressed steel, in 2 different styles, acorn and dome. 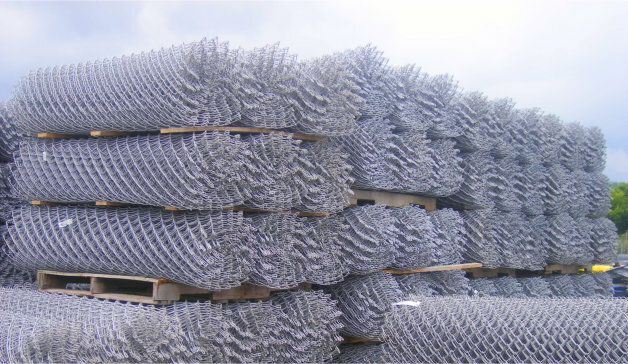 Framework is the tubular steel pipe that makes up the posts and rails of a chain link fence; it is available in a wide array of diameters and wall thicknesses. When talking about the diameter of a fence post, there are a few important things to know. First , similar to dimensional wood products, steel posts and fittings are usually labeled in nominal sizes; so, for example, a fence post listed as 2” is actually 1 7/8” O.D., and a fitting listed as 2" is meant to fit a 1 7/8" O.D. pipe. Second, fence pipe is measured in outside diameter (O.D. ); so, if you see that a post is 1 7/8”, it means that the diameter of the outer wall of the post is 1 7/8”, unless stated otherwise. The size of the fence post that you use will be determined by a number of factors, including: the height of the fence, the gauge of the fabric, and the primary use of the fence. For example, a 4’ or 5’ residential fence with 11 gauge wire can usually be installed with 1 5/8” diameter line posts and 2” terminals. On the other hand, an 8’ commercial grade fence with 9 gauge wire will require line posts that are at least 2 ½” in diameter and terminal posts that are at least 3”. A general rule of thumb is that your terminal posts should be at least 1 size larger than your line posts. Another factor to consider in choosing your posts is whether you will be using some type of privacy screening on the fence, either now or in the future. Privacy screening, slats, and fence weave products all add surface area to the fence, thereby increasing the wind load on the fence. You will typically have to increase your post sizes when using such products. So, on the 8’ commercial fence in the example above, you may need to switch to 3” line posts and 4” terminal posts. Depending on the estimated wind load on your fence, you may also have to adjust your posts wall thickness, spacing, and footer size/depth. A thorough discussion of wind load is beyond the scope of this introductory article. For more comprehensive information, view the Chain Link Fence Manufacturer’s Institute’s Wind Load Guide. Almost all permanent chain link fences have a top rail to support the weight of the chain link fabric and keep it from sagging over time. The fabric is tied to the rail using wire ties, which keeps the fence tight and prevents the fabric from being pushed down for easy ingress onto the property – either by an animal or trespasser. Top rails are typically sold in 21’ sections (though they may be cut shorter for transportation purposes), and are either swedged* end or are sold with sleeves that can be used to splice the rails into one continuous rail. The top rail attaches to the terminal (end or corner) posts via rail ends, and runs through loop caps on the line posts. *A swedged rail is tapered at one end so that it fits into the unswedged end of another rail, enabling you to create one long continuous rail. A bottom rail serves the same purpose as the top rail – preventing the fabric from being pushed inward, thereby allowing easy access. Unlike top rail, however, bottom rail does not run in a continuous line; it must be cut down to fit between each section of fence. It attaches to the terminal post with an end cap, and line posts with line rail clamps. Many homeowners / fence installers choose to forgo the bottom rail in favor of bottom tension wire, which serves the same purpose, but is a less expensive alternative. Often, chain link fences taller than 6’ also have a mid-brace rail, at least on each section between a terminal post and line post. The mid-brace rail provides support for the terminal post against the tension of the stretched wire fabric. In other words, it helps to keep the terminal post from being pulled over due to the high tension needed to keep the stretched fabric taut. The typical diameters for top rail are 1 3/8” O.D. for residential installations and 1 5/8” O.D. for commercial installations, and most fittings are available for both sizes. Fabric is what puts the “chain link” in chain link fence; it is created by a machine that weaves together 2 strands of metal wire into a mesh. A typical chain link mesh will have a diamond size (measured on the diagonals) of 2” or 2 ¼”, although smaller diamond sizes of 1 ¾” and 1 ¼” are also common. In fact, most chain link pool fences are constructed of 1 ¼” mesh to meet ICC pool codes because the smaller diamond size makes the fence more difficult to climb (Note: regulations do vary by municipality, so check with your local building department before buying your materials). The diameter of the wire strand is what determines the gauge of the chain link. It is a little counter-intuitive, but the higher the gauge, the thinner the wire; so, for example, 9 gauge galvanized chain link fabric is made from wire strand that is .148” in diameter, while 12 gauge galvanized chain link fabric is made from wire strand that is only .106” in diameter. Most galvanized residential chain link fences use wire fabric that is 11 or 11 1/2 gauge, whereas most commercial fences use 9 gauge wire fabric. 6 gauge fabric can also be used, however it is very heavy and hard to stretch, so it is usually reserved for only heavy industrial and high security applications. On the flip side, 12 gauge and 12 ½ gauge wires are very thin, and are typically used for temporary fencing applications.